In 2009 the latest edition of Yankee Stadium debuted. 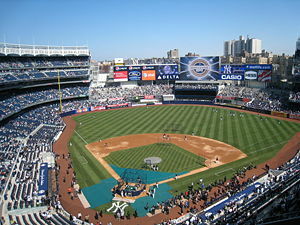 Yankee Stadium is the home stadium of the New York Yankees, a major league baseball team. It was located at East 161st Street and River Avenue in The Bronx, New York City. Known as "The House That Ruth Built," the stadium opened in April 18, 1923 with Babe Ruth as the star player. The opponent that day was Ruth’s previous team and the Yankees' long-time nemesis, the Boston Red Sox. In 1921, the Yankees and Babe Ruth were outdrawing their counterparts, the New York Giants, who denied them the use of their shared field at the Polo Grounds. The Yankees bought 10 acres in the Bronx from the estate of William Astor. Rich with box-office income, Yankees' management at first planned a huge stadium seating over 100,000. However, the initial design was scaled back to the current one: three decks in the horseshoe-shaped main stands, with bleachers and scoreboards in the outfield. Built at a then-enormous cost of $2.5 million, the stadium seated 70,000. A 1976 remodeling dropped the number of seats to the current 57,546. The first night game was played at the stadium on May 28, 1946. Besides baseball, Yankee Stadium has been host to many memorable football and soccer matches, as well as public speeches, patriotic rallies, and religious events. Yankee Stadium remained relatively unchanged until 1973, when the team moved out for two years, playing at Shea Stadium while the ballpark was refitted from top to bottom. Very little of the old stadium remained: the playing surface was lowered; the upper decks were cantilevered for a better view of the field; wider seats were installed; the original roof was removed; a replica facade was placed on the upper deck; three escalator towers were added; and a "telescreen" was added for instant replays. Monument Park was preserved with its memorials kept in place behind the center-field wall. When the Yankees returned to their refurbished stadium in 1976, a new era began. The Yankee name once again became associated with perennial winners. As of 2006, the Yankees were one of the few professional sports teams valued at over $1 billion. In 2006, the Yankees began building a new $2.3 billion stadium in public parkland adjacent to the stadium. Many of the iconic features of the original stadium, such as the frieze and Monument Park, were incorporated into the design of the new venue. Yankee Stadium closed following the 2008 baseball season, and the new stadium opened in 2009, adopting the "Yankee Stadium" moniker. The original facility was not demolished until 2010, nearly two years after it closed. It is being converted into parkland. Often referred to as "The House that Ruth Built," Yankee Stadium was the first baseball park to be labeled a "Stadium" rather than a "Field," a "Park," or a "Grounds." In ancient Greece, a stadium was a foot-race arena, and Yankee Stadium's grass field was surrounded by a quarter-mile running track, which effectively also served as an early "warning track" for fielders, a feature now standard in all major league ballparks. "The Stadium" favors left-handed batters because of a shorter right-field fence, which was once called "Ruthville." Today it is known as "the short porch," although the field has become much more symmetric over the years. In contrast, the park has been less favorable for right-handed batters. Under the original configuration, the outfield distances were 295 feet from home plate to left field, 460 feet to left center, and 490 feet to straightaway center. Left-center soon came to be called "Death Valley," in reference to the high number of balls hit to that area that would have cleared the wall easily in most other parks, but resulted in long "outs" in Yankee Stadium. Although the fence has been moved in several times over the years to make it more hitter friendly, the park remains one of the most difficult for right-handed hitters. Joe DiMaggio reportedly lost more home runs due to his home park disadvantage than any player in history. As for left-handers, Roger Maris hit 61 home runs in 1961, and Babe Ruth hit 49 or more homers in five separate seasons, with with a peak of 60 in 1927. Switch-hitting Mickey Mantle hit 54 in 1961. Another factor favoring hitters is Yankee Stadium's bleachers. Often referred to as "the black," the seats behind center field are painted black and not occupied during baseball games. Known as a "batter's eye," this allows batters to track the ball as it is pitched, as the "black bleachers" section is directly in front of them. If fans were allowed to sit in this section, the advantage would be reversed making it difficult for batters to track the ball if a substantial number of fans were wearing white shirts. The deep left-field area also allowed easy accommodation of football. 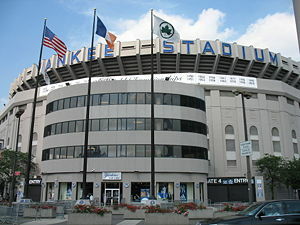 Many college and professional football contests were held at Yankee Stadium prior to renovations in the 1970s which rendered the stadium primarily a baseball facility. 1937 301 ft. 402 ft. 457 ft. 461 ft. 407 ft. 344 ft. 296 ft. 82 ft. The team's magazines indicate that there may be an area of center field as deep as 417 feet. If so, it is unmarked. 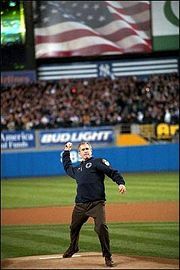 President George W. Bush throws out the first pitch at the 2001 World Series. Yankee Stadium has been the scene of such historic events as Babe Ruth's then-record 60th home run in 1927; the tearful farewell addresses by Lou Gehrig in 1939 and Babe Ruth in 1948; Don Larsen's perfect World Series game in 1956; Roger Maris's then-record 61st home run in 1961; Reggie Jackson's three home runs in a World Series game in 1977; and many on-field celebrations of World Series championships. In addition, the 1939 and 1977 Major League Baseball All-Star Games were held there, as well as the second 1960 All-Star Game. The 2008 All-Star Game is also scheduled to be played there. Yankee Stadium was owned by Rice University from 1962 until 1971. Rice University alumnus, John Cox, acquired all of the capital stock of the stadium holding company in 1955, donating it to his alma mater in 1962. Though the university owned the stadium itself, the Knights of Columbus owned the actual real estate underneath. The City of New York acquired the property by eminent domain in 1971 for $2.5 million. Since its 1923 opening, 37 of 83 World Series have been played at Yankee Stadium, with the Yankees winning 26. Brooklyn Dodgers, in 1955, their only World Championship won in Brooklyn before moving to Los Angeles. 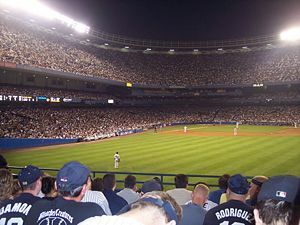 Besides its famous short right field fence, Yankee Stadium has a number of unique features that have made it a sports icon, and particular of baseball. One of the most distinguishing characteristics of Yankee Stadium is the facade. Originally, the facade was a series of copper arches (painted white in the 1960s) that ran around the roof of the grandstand's upper deck. However, the renovation of the 1970s greatly scaled back this roof, and the facade was removed. 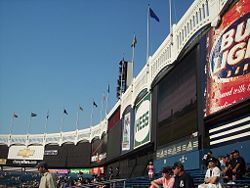 A white replica was run along the bleacher billboards and scoreboard, where it stands to this day. In the new stadium, the facade will return to the upper deck roof. The Facade is used as an icon for Yankee Stadium, and the New York Yankees ballclub. This can be clearly seen in its major use in graphics for the YES Network. While it is called "the Facade" by fans, broadcasters, and Yankees officials, the correct term would be "frieze," which is used very infrequently. 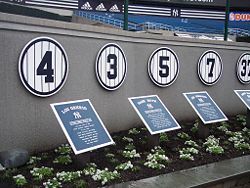 Monument Park is a section of Yankee Stadium which contains the Yankees' retired numbers, a collection of monuments and plaques pertaining to the New York Yankees and other events to take place at the stadium and in the city. Outside the stadium's main entrance gate, stands a 138-foot-tall exhaust pipe in the shape of a baseball bat, complete with tape at the handle that frays off at the end. "The Big Bat" is often used as a meeting place for people who will be sitting at games together but arriving separately. 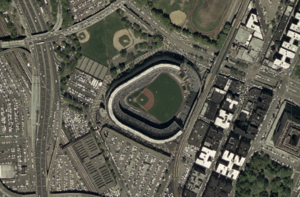 Yankee Stadium was built on a five-sided, irregular plot of land. This gave it a very distinctive asymmetrical shape. For many years, and even today after remodeling, left field and center field were and are much more difficult areas to hit home runs than right field. The designers' plans to extend the right-field, upper tiers compelled a short right field area. There would have been ample room for a "normal" right field if that design element had been omitted and the bleachers had been made much narrower. A Hammond organ was installed at Yankee Stadium in 1967, and was primarily played by Eddie Layton from its introduction until his retirement after the 2003 season. The playing of the organ has added to the character of the stadium for many years, playing before games, introducing players, during the national anthem and the rendition of "Take me out to the ball game" during the seventh-inning stretch. In recent years, the use of the organ has been decreased in place of recorded music between innings and introducing players. The New York Giants football team played at Yankee Stadium from 1956 to 1973. They left the Polo Grounds, where they had played since their founding in 1925, and won the NFL Championship in their first season in the stadium, defeating the Chicago Bears 47-7 on December 30, 1956. The football field at Yankee Stadium extended down the third base line. In the early years, extra bleachers were added in what would be right field. Later, the permanent bleachers were the only seating on that side of the field. The 1930 and 1931 Army-Navy Games were played at Yankee Stadium. Army won both of them, by scores of 6-0 and 17-7. Army played Notre Dame there 20 times from 1925 to 1946. In the 1928 game, Army led 6-0 at halftime, before Notre Dame coach Knute Rockne invoked the memory of his school's greatest football hero to that point, George Gipp, who had died in 1920. Notre Dame played 24 games at Yankee Stadium, going 15-6-3. Army played 38, splitting them, 17-17-4. New York University played more games there than any other school, 96, using it as a secondary home field from 1923 to 1948, with a record of 52-40-4. Nearby Fordham University played 19 games there, going 13-5-1.
losing to Fordham in 1934 and 1935. The eighth, in 1963 between Notre Dame and Syracuse University, was won by Syracuse, 14-7. This was a rematch between the teams involved in a controversial 1961 game (officially won by Notre Dame 17-15) in which both sides claimed victory. Starting in 1971, the stadium hosted the Whitney M. Young Urban League Classic, a game between "historically black colleges," often featuring Grambling State University of Louisiana, coached by Eddie Robinson. The classic helped to spread the fame of Grambling and other similar schools. The classic was held at Shea Stadium during the 1974-1975 renovation of Yankee Stadium, and was last played there in the 1987 season, the last time a football game was played there. Grambling lost to Central State University of Ohio, 37-21. It has been held at Giants Stadium in New Jersey's Meadowlands Sports Complex ever since, though the Yankees remain a supporter of the event. The first documented soccer game at Yankee Stadium took place on June 28, 1931, when Celtic F.C. beat the New York Yankees of the American Soccer League 4-1 in front of 10,000. On May 4, 1947, Hapoel of Tel-Aviv toured the United States and made Yankee Stadium its first stop on the tour. More than 53,000 tickets were sold for this match which saw Hapoel beat the New York Stars 2-0. This match may have also been the first, televised soccer match in the United States. On June 15, 1952, Manchester United were crushed by their English rivals Tottenham Hotspur 7-1 at Yankee Stadium. On June 8, 1953, the U.S. national soccer team lost to the England national team 6-3 in front of 7,271 fans. A few days later on June 14, Liverpool FC drew 1-1 with BSC Young Boys from Switzerland. In 1967 the United Soccer Association placed a team in Yankee Stadium called the New York Skyliners, and their opening game at the stadium drew 21,871 fans. Several international matches were played there in 1968. The New York Cosmos of the North American Soccer League used Yankee Stadium for home games in 1971 and then again in 1976 where they averaged 18,266 spectators a game. Many boxing matches have been held at Yankee Stadium, notably Joe Louis's first-round knockout of Max Schmeling on June 22, 1938. Heavyweight champions Jack Dempsey (after losing the title), Rocky Marciano, Floyd Patterson, Ingemar Johansson, and Muhammad Ali all had at least one fight there. Beginning in 1950, the stadium began holding religious conventions of the Jehovah's Witnesses. The first convention attracted 123,707 people, more in a single day than any other stadium event up to that time. These conventions would continue on until the late 1980s. When room ran out in the stands, the ladies were asked to remove their heels, and people were brought in to sit in the outfield. There was also a makeshift camp nearby where the program was broadcast for hundreds of others to listen to. Billy Graham held large gatherings at the stadium. Reverend Moon poses in front of a poster advertising his Yankee Stadium speech. On October 4, 1965, Pope Paul VI celebrated a Mass at Yankee Stadium during a visit to the United States in front of a crowd in excess of 80,000. This was the first Papal Mass ever delivered in North America. Fourteen years later, on October 2, 1979, Pope John Paul II also celebrated Mass there. On June 1, 1976, Reverend Sun Myung Moon delivered the message, "God's Hope for America," to tens of thousands at Yankee Stadium, in what was the largest Unification Church event in the United States to date. The first rock concert held at the stadium was on June 22, 1990 by Billy Joel. It was also the site of two dates of U2's ZOO TV tour in 1992. During one song, Bono paid tribute to the show's setting with the line "I dreamed I saw Joe DiMaggio/Dancing with Marilyn Monroe…." Pink Floyd also performed two sold-out shows at this venue on their 1994 tour in support of The Division Bell album. 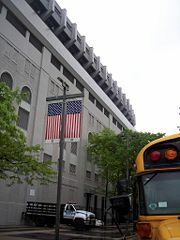 The stadium was also the site of a memorial service on September 23, 2001 in the aftermath of the September 11, 2001 attacks. However, the stadium has been used almost exclusively for baseball since 2001, as most other concerts and events seek the more modern facilities of Madison Square Garden or Giants Stadium. After years of speculation that the Yankees would build a new ballpark to replace Yankee Stadium, construction on a new facility began on August 16, 2006 with a groundbreaking ceremony across the street in Macombs Dam Park. Demolition of the original Yankee Stadium was completed on May 13, 2010. A 10-acre park complex called Heritage Field will be constructed on the old stadium site, accounting for 40 percent of the original parkland that is now occupied by the new Stadium. The groundbreaking ceremony for Heritage Field took place on June 29, 2010. Previous Stadium Facts, figures, photos and more. www.ballparks.com. Virtual Tour of Yankee Stadium. www.destination360.com. Yankee Stadium in Google Maps. maps.google.com. This page was last modified on 30 July 2013, at 21:01.